This entry was posted on Tuesday, February 20th, 2018 at 1:17 pm and is filed under simple pleasures. You can follow any responses to this entry through the RSS 2.0 feed. Both comments and pings are currently closed. Ha ha. Great. Something for lovers of the English language! Oh, yes! 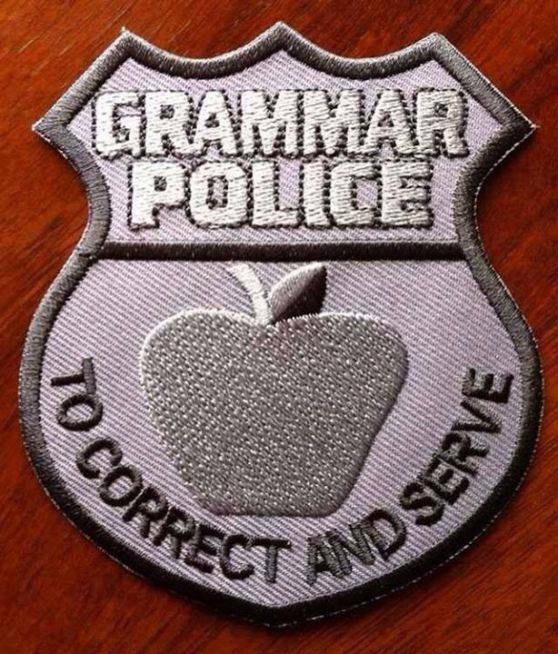 As a bit of a grammar nerd and police, this delighted me more and more with each line. The malapropism was my favorite. Here’s your badge, Abigail. Wear it proudly. I do hereby solemnly swear to support the rules of proper English, and to the best of my ability will uphold the grammar and syntax of the English language from those wishing it injury. I used to have an education. This is great! Are you kidding? This is genius. Will you lose all respect for me if I confess I hadn’t heard of a chiasmus? Hello, beautiful. We keep learning new things, thanks to BoB. I must admit, it was new to me, too. Yet obvious by context. Bluebird of Bitterness blog: Come for the clever collections and stay for the vocabulary expansion. I collect words the way normal people collect… I don’t know, normal things. As a lover of the hyphen, I say hi-larious. Loved the Oxford comma particularly! Dang! Why didn’t I think of that? I absolutely loved this one! I’m reblogging it on Dragons Rule OK. He was harlfway through his meal when he realised his wine had not arrived, so he called the waiter over. I utterly and literally love this post, though it should be said I never walk into a bar as I might hit my head on it. Instead, I always enter a bar. An alliteration ambles into an alcoholic alcove. A redundancy walks into a bar and orders a scotch on the rocks over ice cubes. I shared your blog with Tom Jenks of Narrative Magazine because it’s so clever. He commented that you’re very talented. In the event you’re interested in submitting anything to him and his magazine, I think he would like that. Wish I knew your name! A man walks into a bar and orders a double entendre so the bartender gave him one. A thesaurus ambled into a tavern.